Solution Saddles Customer Stories: Mel and her Maxi Cob are thrilled with their high scores in their SMART™ Native saddle. Mel and her Maxi Cob are thrilled with their high scores in their SMART™ Native saddle. 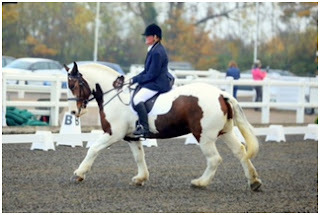 I’ve had my horse, Coolie, for 2 years now; he is what you’d call a maxi cob and we had the most dreadful time with his traditional saddle slipping to the right. The saddler would have to come out almost every two months to re-flock and juggle, but as soon as Coolie lost or gained weight, I’d have to get the saddle adjusted again. A friend of mine suggested we try a SMART™ saddle, so I arranged a home consultation visit with my local Solution Saddles Approved Advisor. I was extremely sceptical but by the end of the test ride I was totally amazed – the saddle hadn't moved and Coolie felt like he was moving much more freely. We have been thrilled to bits with our Native GP saddle ever since; I have never looked back. A year later and we have a new found love of dressage - well I have (not so sure Coolie enjoys his circles as much as I do)! I had wanted to invest in a dressage saddle for a while, but was unsure whether it would be worth it for us at our very basic prelim level. However, I decided to take the plunge, and with the help of our lovely Solution Saddles Approved Advisor, we decided on a SMART™ Native Dressage saddle, which I had customised with a Suprabloc kneeflap. In our first competition in our new saddle, we achieved the two highest scores we’ve ever had in any dressage test, as well as the best collectives for rider’s seat and position that I’ve ever achieved. We got a first and second place as well as some lovely comments from the judge. I cannot recommend these saddles highly enough or thank Solution Saddles enough for pandering to my whims!